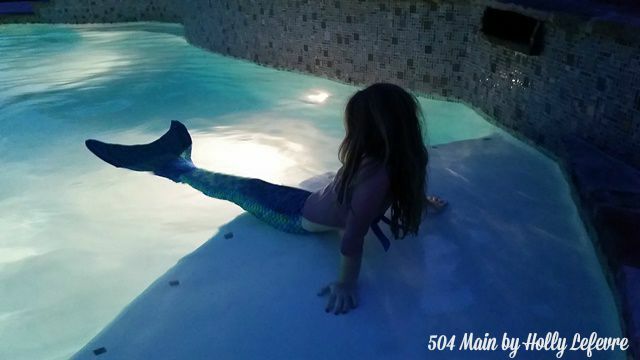 504 Main by Holly Lefevre: Who Doesn't Want to Be a Mermaid? I vividly remember wanting, wishing to be a mermaid growing up. 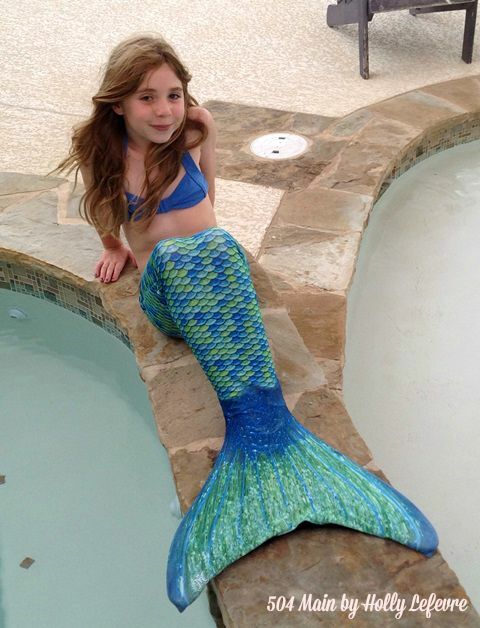 My daughter has the same wish and thanks to this opportunity with Fin Fun Mermaid Tails, my little cutie has transformed into a gorgeous mermaid. 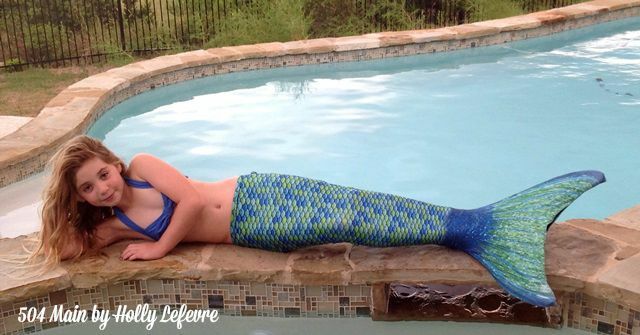 When we moved to Texas last year, I showed my daughter a video of a friends daughter swimming in her mermaid tail - she immediately wanted one. My friend told me her daughters tail was from Fin Fun, and of course I looked right away. OH MY MERMAIDY GOODNESS - this is the most magical place. So many gorgeous colors of swimmable mermaid tails! Yes, I said swimmable - these tails are not a costume! Yippee! 1 - She has to wait until the pool was ready. 3 - She had to work on earning it - chores, good deeds, etc. 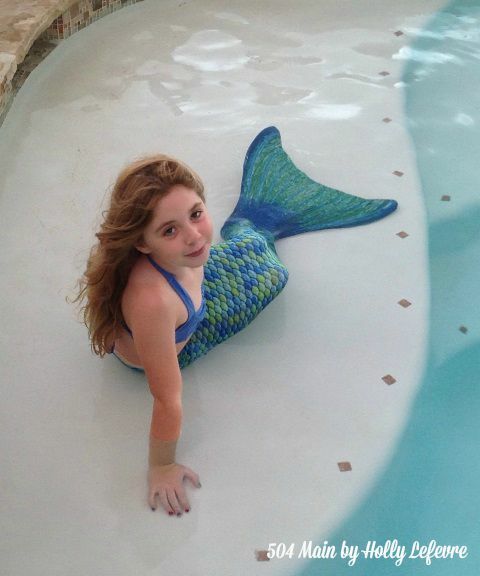 Fast forward almost one year...my girlie is an amazing,competent swimmer, our pool is done and it was time for a Fin Fun Mermaid Swimmable Tail. It was finally her turn to live her Mermaid dream! Jules participated in Mermaid Mania, a week long mermaid extravaganza (with daily giveaways) incorporating, writing, art, service, and swimming, with Fin Fun this summer. She did not win her tail during Mermaid Mania, but she did an amazing job with her activities...and Mom (finally) said "Yes to the tail!" 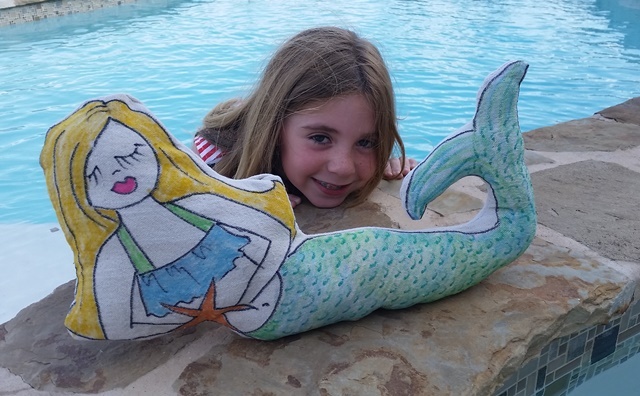 I chose Fin Fun Mermaid Tails because I have friends whose daughters have them and they are thrilled with the quality. They also have a huge variety of colors and adorable matching bathing suit sets to match. 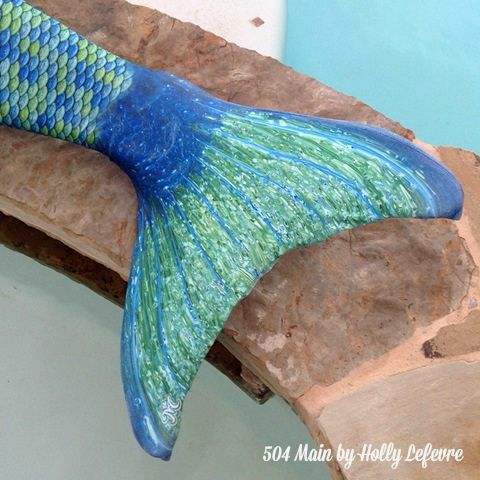 Jules chose Zoey's Aussie Green Mermaid Tail from the Mermaiden Collection. When that tail arrived she could barely contain herself. I was thrilled when we pulled it out of the box - it is so pretty! To go along with our tail we also have the Monofin Jr. Without the monofin, the tail is still totally adorable but the monofin fills out the bottom of the tail and in Jules's words, "Makes you swim super fast." The video below was taken the day we received the mermaid tail! I smile every time I watch it! Of course we have the bathing suit too! A mermaid must match! Jules selected Zoey's Aussie Green Mermaid Clamshell Bikini Set. I can barely get her out of the pool right now. Jules has had so much fun showing her tail to her friends and swimming. She tells me, "I feel magical and I bet I can swim faster than anyone." Now lets' talk about swimming in the tail! Safety is the number one factor whenever your kiddos (or anyone for that matter) is in the water. 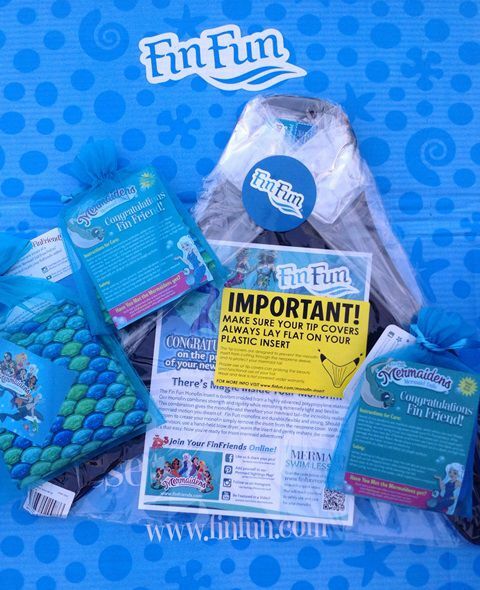 Fin Fun has a great video outlining safety tips and fin usage. Be sure you are sitting in the water or on the edge of the pool - you should NOT hop around in your tail/fin - it is not for walking or hopping - it is for swimming! Put the tail on (it is meant to fit tightly). Lift the bottom portion of the tail up, exposing your feet. Pull the tail over the monofin, making sure the tips of the fabric line up with the tips of the monofin. As I mentioned, I required that my daughter be a proficient and totally competent swimmer before she could have a tail, and she is. 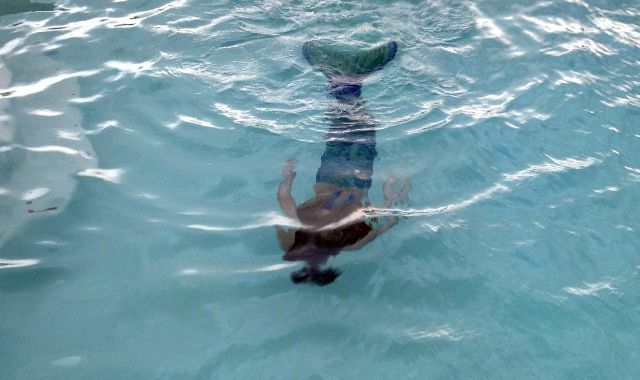 Even so, swimming in a mermaid tail and monofin is a different experience, so the first time my daughter used the tail, I was in the water with her, making sure she was fine. And the rule in our house - no matter what - is that you may not swim without an adult present anyway. Honestly, she was 100% comfortable in the fin right away and I think she would sleep in her Mermaid Tail if I'd let her. Since we received her tail, Jules swims in it at least twice a day. She already loved swimming but now she loves it even more! My sweetie is learning to do tricks now! And, I have to tell you it is magical watching her swim in her tail! Does you child dream of being a Mermaid? Visit Fin Fun to see all of their beautiful SWIMMABLE mermaid tails. 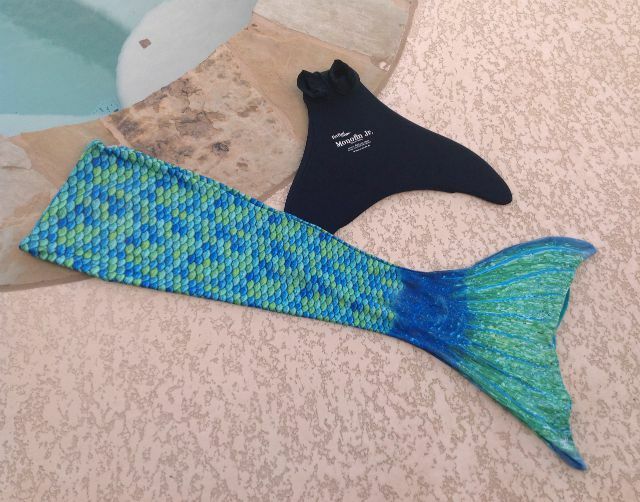 Would you swim in a mermaid tail? 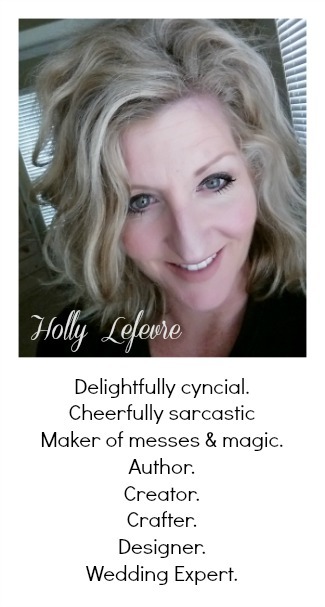 This post is written and created at 504 Main by Holly Lefevre Disclosure: Product or compensation was provided by Fin Fun. Opinions and content are brought to you by 504 Main. My little girl LOVES mermaids, too! She wants to be one when she grows up, lol. What a fun experience for your little girl.